Happy New Moon Gods & Goddesses! Wearing my African bloodstone yoni egg as I embrace the energy of the new moon. She assists me, amplifying my power & establishing my vision as I set my intentions. The first new moon of the year is a powerful time for planting the seeds I desire to grow. I asked Spirit what energy I need to embrace to manifest the intentions I’ve set & this is the card I received. This card represents the end of things as previously known. Symbolizing death of the old self to pave the way for regeneration & enlightenment, it allows removal of fears by confrontation. It connotes change through transfiguration and the realization of new opportunities. There are some things that I’d been holding on to in the recesses of my mind, that the retrograde has returned to conscious thought. It can be frustrating coming face to face with emotions you’d only hoped you’d done away with for good. But it’s all a part of healing. And repressed is not the same thing as released. Dead leaves will only feed to no avail until the whole plant dies. And I’m trying to grow a garden. So tonight my job is to let go. I release what is dead. I die to be reborn. I trust the Universe to bring me the highest good. And it shall. How are you embracing the Capricorn New Moon energy? What do you feel you need to do to manifest your intentions in the new year? Triiin & I have had a flood of amazing crystals entering our lives lately. A couple weeks ago, we made a trek to House of Intuition and racked up on some crystalline critters during a Sunday Sale they were having. Crystal Haul coming soon for that one. I’ve received a crystal wand crafted by the hands Nebheru! (I must tell you all more about that one). 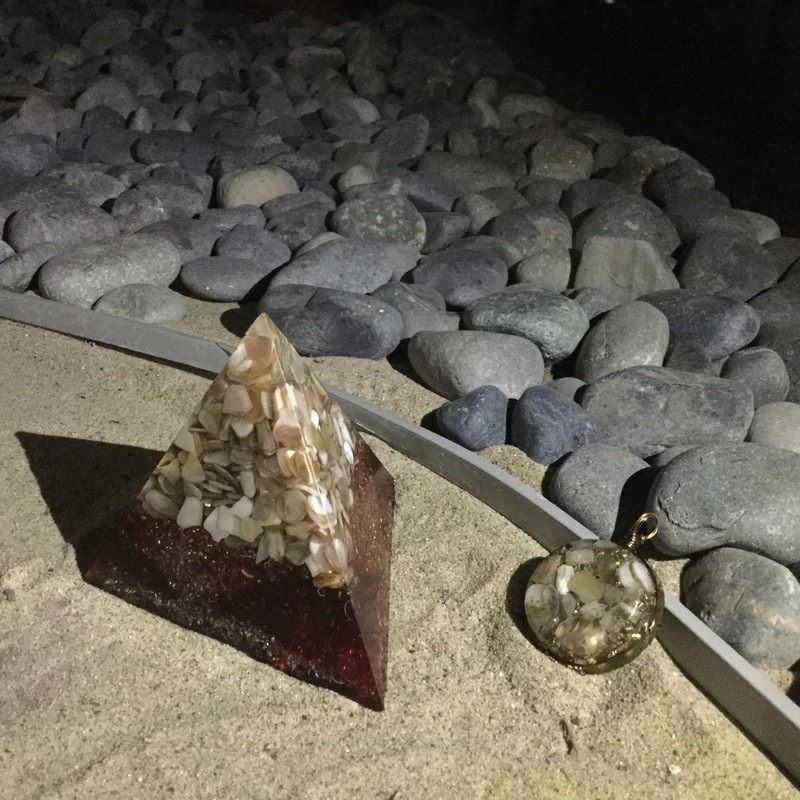 Then Superior Life Energy sent Triiin and I a lovely Moonstone pendant & a power-packed Clear Quartz Orgone Pyramid. First things first a brief synopsis of Orgonite. ORGONITE – Organic fiberglass resin and inorganic metal shavings combined to produce an object that attracts etheric energy. They usually are crafted in a cone or pyramid shape. 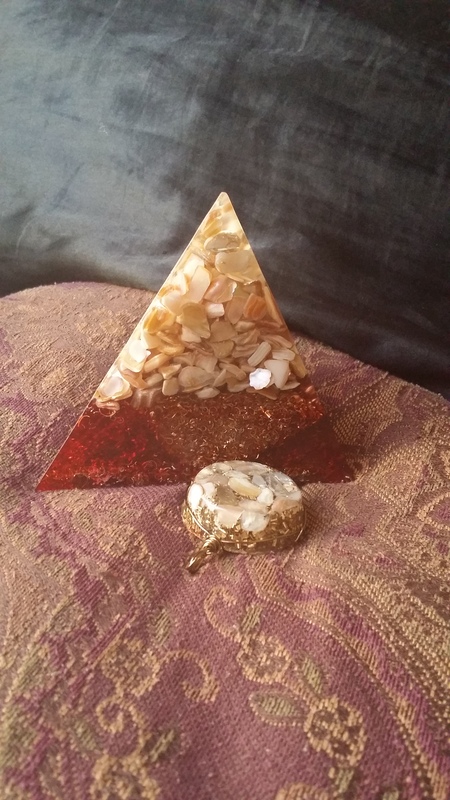 Orgonite generates Orgone energy, that acts as an environmental ionizer. They literally contain the ability to change the energy of any place they inhabit! Orgonite may contain crystal compounds or other metaphysical ingredients to aid in the process and add other healing benefits. I have had some really powerful experiences with Orgonite. Orgone’s energetic offering is no joke! Superior Life Energy specializes in Orgonite crystal pieces. Every time I receive a piece from Superior Life Energy its always an energetic blessing. The pieces are beautiful, well made, and power-packed. These most recent pieces did not disappoint. This pendant consist of Clear Quartz, seashells, and Moonstone. It carries a strong feminine healing energy. I love wearing it during my moon rituals and in the moonlight in general. She definitely responds to the lunar vibes. I also wore here as my everyday pendant for a while as we got acclimated. This beauty definitely granted blessed vibes as I maneuvered throughout my day. Seashells combine with Clear Quartz and Moonstone give this beauty her power. Seashells carry the power and cleansing energy of the ocean. They contain a natural ability to dispel negative energy and bring a pure healing vibration. Not to mention the palpable conscript between the Sea’s energy & the Moon. Moonstone is a crystal truly connected to the Divine magic of the Moon. This stone is a great companion on one’s inward journey. 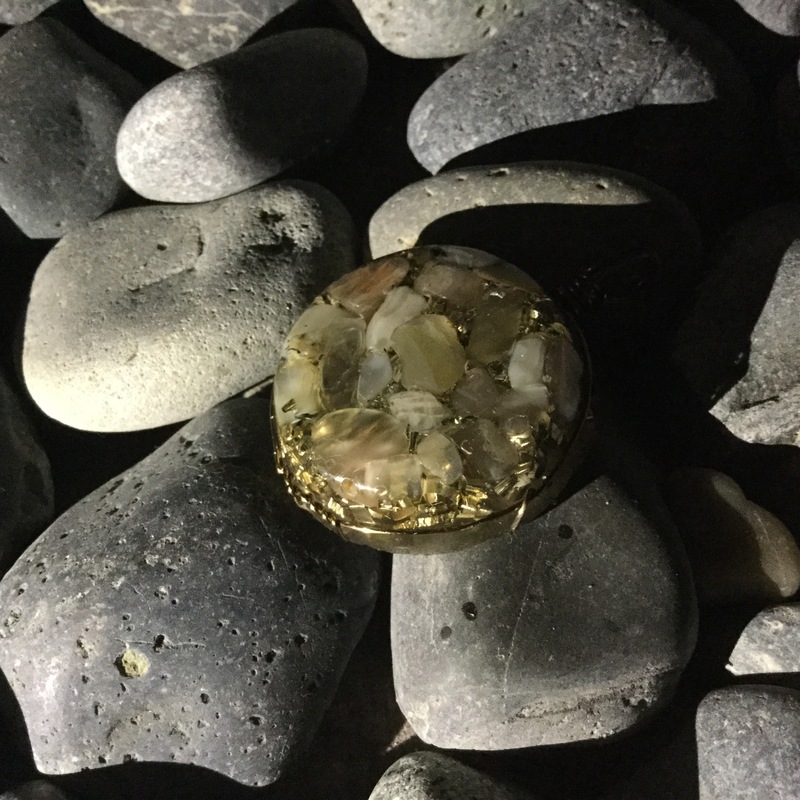 Nicknamed the “Travelers Stone”, it grants protection on physical journeys as well, especially after dark. Gray & White Moonstone (like the stones included in this piece) sharpens psychic perception into the unseen, stimulating visions & dream work, while carrying all the energy and divine potential of the New Moon. This stone activates Kundalini energy in women while offering men increased emotional balance. Gotta love that moon power! Clear Quartz is a master healer. It’s vibration is actually neither a liquid nor a solid. It is a metaphysical wonder. A divine gift from Gaia. This is a readily programmable crystal and great in the use of healing all ailments, physical, mental, & spiritual as Clear Quartz contains a powerful ability to dispel negativity. This pyramid is made of Clear Quartz & Seashells. Seashells bring the serene healing vibes of the Sea, along with their ability to clarify vibrations in their energy field. Clear Quartz is a master healer and quite the powerhouse. Its ability to transmute energy makes it the perfect compound for Orgonite. It is an excellent stone for bringing harmony and balance to ones environment. I have used this pyramid in meditation and it brings me much peace. I keep it on a secondary alter in my home (my other Superior Life Energy pyramid already has a spot on my main altar) and since its arrival I have definitely felt the its zen, healing vibes, and powerful balanced energy. 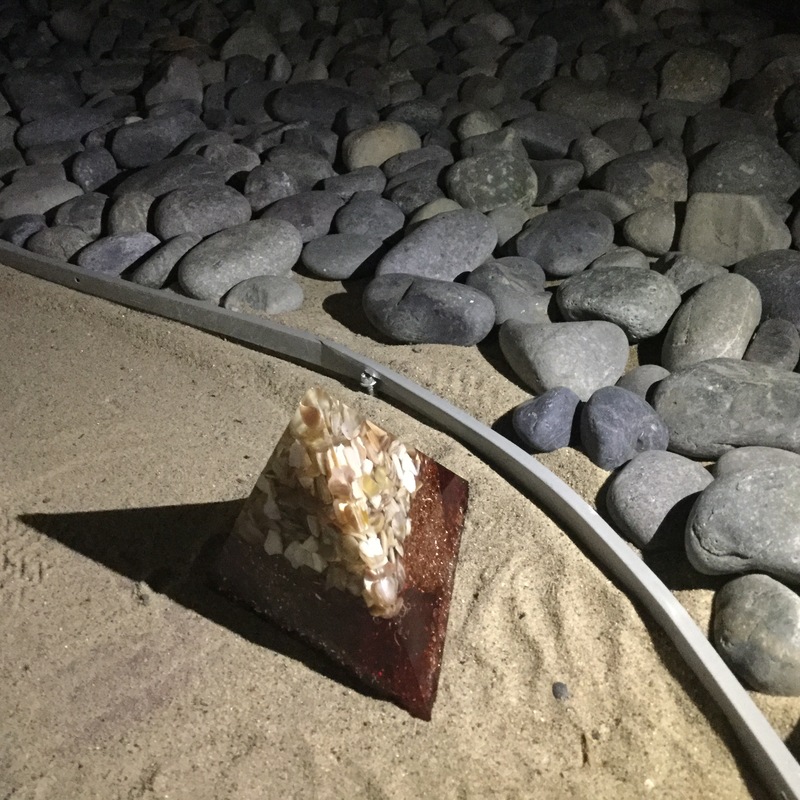 I used this pyramid over my heart chakra during my most recent Full Moon ritual and I believe it brought some true balance to my heartspace that allowed room for wonderful things to transpire. I’m so glad to have added this metaphysical beauty to our collection! All of Superior Life Energy’s energetic blessings always give me joy. And organite definitely bring some much needed healing and balance to the mix. Coupled with the use of Clear Quartz, who can argue with stones that bring equilibrium, progression and healing in any facet of your life or being that may need it? Do any of you own orgonite? How about Clear Quartz, in any fashion? Did you guys experience some of the effects these crystals boast? I’d love to hear your stories! More rock love and metaphysical talk coming soon to your eyes and ears via Miiiri-baby. Look out for talk of crystal wands and crystal balls!